Crafted from floral mesh lace, the women’s frilly midi dress from London-based Self-Portrait boasts a fit-and-flare silhouette. Adorned with asymmetric ruffle trims and a curved faux placket detail that extends up the right shoulder, the dress features an off-shoulder design with a sleeve insert on the other side. 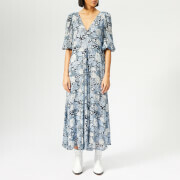 Fastened at the back with a zip, the dress is detailed with a viscose waistband that lends definition and lined with a tonal slip to the mid-thigh.